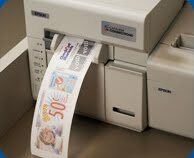 Ever seen the coupons that print out of machines after you make a purchase? These are what will turn you into a cuckoo coupon lady – at most places these are called Catalinas, but at Walgreen’s they are Register Rewards. At Walgreens, you can get a “Catalina” coupon called Register Reward. 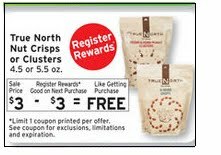 A Register Reward is a coupon that prints after you make a qualifying purchase. It is typically good for “X” amount off of your next transaction. Pictured below is what the ad will look like in the Walgreen’s Circular. When you buy the advertised item, after paying, you will receive a coupon (Register Reward) to use on your next purchase. 2. You cannot use the exact Register Reward on the same promotion in a following transaction. Ie.. if you buy Olay and get a RR (Register Reward) you cannot use that RR to buy another Olay. If you do so, you will not receive a second RR. You either have to pay for the soap and accumulate the catalinas for a different purchase, or you’ll need to use the catalinas from a different promotion to pay for the second Olay. 3. FILLER ITEMS: You have to have as many items purchased as coupons (RR is considered a coupon)! If you bought one Olay and tried to use a coupon and a RR to pay, it would not be accepted. You would need to buy one more item – called a “filler item” so you have 2 products and 2 coupons. The extra item you buy doesn’t have to match up with any coupons! I receive this question a lot: if a RR is going to print at Walgreens, do you need a filler item for your coupon ratio? The answer is no, the RR that is supposed to print has no bearing on your coupon ration. This means if you are purchasing 2 products with 2 coupons, you can still expect RR’s to print (no filler items required!) However, if you want to pay for the 2 products with 2 coupons and an RR, then get a filler item. 5. Walgreens coupons from their weekly ad and/or coupon booklets (learn more about those here) available throughout the store, from the pharmacy, or even from a $0.99 Children’s activity booklet do NOT count towards your coupon to item ratio. (In other words, the register will not beep if you are using more Walgreen’s coupons than items. Remember though, that Register Rewards and other manufacturer’s coupons can only be used once per each item purchased). Common question: Can you use or stack a walgreens in-ad coupon with walgreens monthly coupon booklet coupon? The answer is yes! Common Question: Do i need to tear out each in-store monthly coupon and give it to the cashier when i check out? or do they just scan it and i keep it in there? if i keep the coupon, i can only use it once per transaction right? and can i use, for example, one shampoo coupon and one makeup, or is it one coupon total from the booklet per transaction? The answer is: If you use a Walgreens Coupon, it will take off up to 4 of the item with just that one coupon! So you can get 4 items and use the coupon once and it will take it off 4 times. You could buy 4 shampoos and 4 makeups, and use just one in-store coupon for the shampoo and 1 for the makeup! They would each come off 4 times. 6. Walgreens Specialty Coupon Booklets: You may find Walgreen’s Specialty Booklets that offer some information about different everyday issues. They are found in the areas in their store that helps with these everyday issues. Many times, these Specialty Coupon Booklets contain coupons in them. Make sure to see if the coupon is a Walgreens Store Coupon or a Manufacturer Coupon, since these booklets may contain both types. 7. Walgreen’s offers a 15% discount to military personnel/dependents on Tuesdays: The days might be different depending on locations in Yorktown Va it’s every Tuesday – so ask you local Wags! Please note that not ALL Walgreens participate with this promotion. 8. Rolling Register Rewards: If an RR is “rolling” that is rare. It is an exception to the rule. It also could be rolling at the time I post the deal, and stop at any time. What it means, is you can use a RR to pay for the exact same item as the RR was triggered by, and another RR will print. All deals are NOT rolling and I will indicate otherwise if they ever are. Walgreen’s Coupon Policy: I recommend that you print a copy of Walgreen’s coupon policy and bring it with you while you shop. If any issues should arise, this coupon policy should definitely help clear things up! Walgreen’s will take all manufacturer coupons, and you can stack it with a Walgreens in-store coupon, but you must hand them the Walgreen’s in-store coupon FIRST! you must have as many products as coupons. If you are stacking an in-store coupon with a MFR coupon, make sure to have “filler” items. These items don’t have to match up with any coupons, they just make it so that you don’t have more coupons than products purchased. You are no longer allowed to use 2 x/x coupons on a BOGO FREE sale. You’d only be able to use one. For example, buy 2 items that are BOGO FREE. Then you could use one $1/1 coupon, not 2. Rain Checks: Walgreens does issues rain checks! Rain checks are good for in-store purchases only and valid for 30 days. You won’t get the RR, so if it’s just for a sale item with no RR, get the raincheck, but if you’re looking for the deal with a RR, you won’t get it. Walgreen’s Coupon Policy on their site. 1. Register Rewards are now to be scanned first, then MFG coupons, and WAG coupons/in-store coupons last. This way it is easier for the register to accept the MFG coupons because it will take off according to the amount left on the item for the WAG coupons and therefore the coupons won’t have to be modified. Also, paper coupons will be processed before digital coupons. 2. Coupons can no longer be modified for a lower price. Ex: An item is on sale for 3.99 and you have a $4 off coupon. In order to use it, you must buy two items: One will be free and the other will cost 3.98. Because the coupon applied to both items, a second coupon cannot be used for the additional item. 3. Walgreens does reserve the right to limit quantities of any item(s) in the store. This will vary per store, so look for additional information or ask a Walgreens employee for clarification. Basically, now that you will have a card, there will likely be limits on deals, like at CVS. That is the biggest difference I see. If the ad reads like this: Buy $10 of certain products, get 5,000 points, you would only earn the 5,000 points one time for reaching the $10. If you want to earn additional points for the same deal, you must do separate transactions. If the ad reads like this: Buy 2 of certain products, get 5,000 points, you can buy in multiples of the deal and receive additional BRP in the same transaction up to the limit stated in the ad. IF you pay for things with points, you can still get Register Rewards! If you pay for things with Register Rewards, you can still get points! Certain sale items will have “Bonus Points” attached to those items – this may or may not be in all markets. Say for example Nivea is $5.00 as a sale item – you’ll earn 5,000 Bonus Points on your rewards card – the equivalent to $5 (1,000 points per $1 spent, $10 for 10,000 points). So it would be equal to obtaining the item FREE – you can then use that $5 to apply towards your next purchase towards regular items as long as they are not one of the items prohibited to be purchased with points. Bonus points will expire 36 months after the date you earn, or after SIX months of no activity. Register Rewards will still be in place……….but, they will be reduced. Walgreens (like other retailers) is in a contract with the Catalina Company – so until that changes, RR’s will still be there, but they may not be as giving as they are now. Your “Loyalty Card” will be monitoring your shopping habits – the Catalina machine will then use those habits to present you new coupons for items you buy most frequently. Everyday Points – Now, you will earn Everyday Points by earning 10 points for every $1. You must add this PERK to your account online to receive this benefit. You will be able to use Balance Reward Points to pay and still earn them on the same transaction! This will not apply to all purchase, but about 90% of them will! Sign up is now open online. Ready to get serious about savings?! View our post 16 Amazing Walgreens Shopping Hacks.